Did you Know These 10 Health Benefits of a Mango? The king of fruits – mango – is admired by everyone due to its juicy taste. 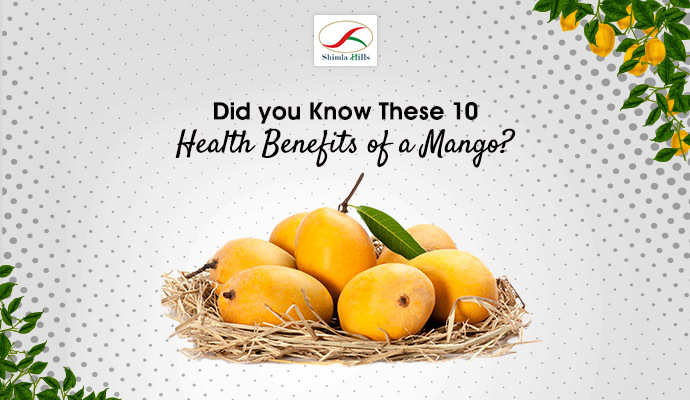 But apart from the lip-smacking flavor, mangoes offer a plenty of health benefits. Let’s highlight the top 10 health benefits of a mango. Boosts Eye Health: The Vitamin A in mangoes promotes good eyesight, prevents dry eyes and night blindness. Keeps Heart Healthy: Fresh mangoes are packed with potassium. The nutrient controls the heart rate as well as blood pressure. Immune System Boosters: There are vitamin C, vitamin A and 25 different kinds of carotenoids present in a mango. They all keep the immune system strong and healthy. Glowing Face: When the pulp of the mango is gently massaged on the face, it helps to bring back the glow. Improvement in the Digestion: The fiber present in mangoes helps in improving the digestion. Reducing Cancer Risk: Quercetin, Gallic, Fisetin, etc. are some of the compounds present in the mangoes. All of them help in the reduction of cancer risk. Weight Loss: The calories content in mangoes is quite less. Also, the high fiber content burns additional calories by boosting the digestive function, thus, helping in weight loss. Prevents Heat Stroke: When the mango juice is consumed during summer, it prevents heat stroke and keeps the body cool. Kidney Stones Prevention: In Chinese medicine, mangoes are capable of reducing the risk of kidney stone formation. Promotes Brain Health: Mangoes also have an abundant quantity of vitamin B6. The same nutrient is essential for improving brain’s health and function. A leading name in the agro-food products industry, Shimla Hills produces and exports top notch quality mango processed products. Totapuri, Alphonso and Kesar are the varieties of mango which are processed by Shimla Hills to produce pulp, puree, puree concentrate and IQF. To get your hands on these premium quality offerings, book your ORDER NOW!